I grew up near Stratford-upon-Avon so today was a special day for me, seeing my home area through the eyes of others and also seeing places that had been on my doorstep for years but that I’d taken for granted and never visited, or that hadn’t been open when I lived here. As a huge Shakespeare fan, I had ben waiting for this day of the tour with bated breath and as good luck would have it, it came round quickly. The weather forecast predicted that the day might not be for the faint-hearted, with rain and drizzle forecast, but all’s well that ends well and the day really was such stuff as dreams are made on. Sorry, that’s too much of a good thing and I think I’ll stop the Shakespeare phrases and get on with the diary entry! All I can say about today’s leg of the tour is wow, what a fun experience. Ah Stratford Upon Avon, the birthplace of the bard and famous all over the world, we maybe useless at cricket but we gave the world William Shakespeare ! Stratford is a lovely town, murder to park in, but lovely and that it has maintained many of its old Tudor buildings is really excellent, especially those associated with William Shakespeare. 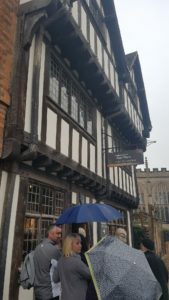 We spent two days in June, part of a visit to the wider area, visiting Mary Arden Farm and Anne Hathaway Cottage and other places, we were in the area fir 11 days in a heatwave. The birthplace of the bard house is very quaint but the new centre added makes it even more interesting with a display of video, interactive features and folios and there was of course the garden with players doing requests. New Hall is now a museum with gardens and the Guild Hall Chapel is stunning. All Saints was very busy and there is of course the family set of graves. They are plain but one family member had a very large tomb built. Shakespeare, wife, daughter and son in law all have markers. I went there many years ago and the interactive centre has been added since. The coach tour was far too short. We had a sunset walk along the river. When we got back to the carpark at 8.30 we were the only ones there. I think we got the last blue badge space in Stratford on arrival and almost the last space as well, behind the Market place, by the police station. Unlike Liverpool, however, Stratford does not charge for blue badge cars in car parks. Hint if you come to the Albert Dock or Liverpool One don’t park down there. Park in Duke Street and cross the road at the bottom. Or park in King Street for £3 for the day. Don’t use the Q park either. The Mary Arden Farm is worth a visit. Take a step back to 1570 and follow the life of a yoeman farmer as his mother was. I visited Anne Hathaways cottage and it was lovely with a beautiful wild cottage garden, we sat on a bench amongst the hollyhocks and foxgloves and roses and it was bliss, visited the building which the renowned Harvard university is named after and all it all, it was a lovely day, think in the height of summer it gets filled with a lot of tourists we was a bit before that so was much quieter, we do have lovely places in Britain we are in a sense very lucky, many people can’t wait to jet of overseas but if only now and then they would consider travelling round their own country they would see some wonderful sights.